At BUSM Operation House Call is a requirement for all medical students. 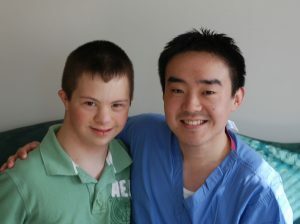 It is taught during the 3rd year pediatric clerkship training, providing a better understanding of the day to day joys and concerns, and expertise, of families who are raising a child with intellectual/developmental disabilities (IDD). Its purpose is to enhance a future doctor’s ability to partner with families and caregivers and individuals with IDD when providing health care. Most individuals with an IDD diagnosis have received this diagnosis prenatally or during infancy or early childhood. Therefore the pediatric training rotation is an ideal time to teach new doctors how to learn from families. Components of the course allow a pediatrician to further understand prenatal counseling and support issues relevant to families in this community. The OHC course requirements include class time with the OHC Parent Instructor, meeting a young co-teacher with IDD, review of the OHC Website materials, a two hour home visit to a volunteer family, and student comments in the OHC Website Student Forum about their home visit experience. Course readings, video, and resources are provided on the OHC Website. These resources are accessible to the students throughout the academic year. Peer learning is encouraged in class and in the student forums as participants learn from various family experiences. Maura Sullivan, OHC BUSM Program Director and Parent Instructor sullivan@arcmass.org.